We Plan to work with golf clubs & their professionals that have the same vision as the Charity. The Charity will work at finding groups & organisations that are involved with young adults with physical & Mental disabilities and match them up with the relevant clubs that wish to support our program. We have identified 2 locations for 2019 where the project will start these are in the North West & Cheshire. We have also links with clubs in Yorkshire & The Midlands but we wish to establish the program first before expanding providing quality rather than quantity. We will hopefully in 5 years roll out in all 4 corners of the UK. 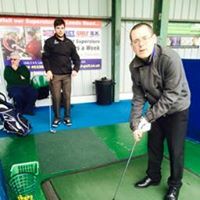 Once he program is up and running we will then encourage participants to start playing golf with the many disabled golf groups available throughout the UK & hopeful encourage them to join a golf club. Golf is good for rehabilitation, socialising, its very therapeutic and improves wellbeing. British Inclusive Golf have many invitational events where people are invited to represent the charity, so there’s will be plenty of opportunity for participants to be involved for many years to come and hopefully give something back to the charity. If funding allows we would like to source a paragolfer or solorider for those who are paralysed and require help in standing up. see attached video this was Nick who played once with the paragolfer but sadly gave in as they cost over £16,000 and there was no way he or the charity could buy one.